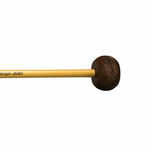 The Malletech Go2 Series presents the Jon Singer Rosewood Xylophone Mallet. Jon has used wooden mallets on his xylophone for many years and found that he liked the heads best after the fibers started to break down. Malletech has found a way to "pre-stress" the surface to get to that perfect, slightly softer attack right out of the bag. Unlike many "rosewood" mallets that are really other species of wood, these are made from marimba bars that didn't make the grade in Malletech's instrument department.